The story of the Irish Brigade is among the most popular told at Gettysburg. The iconic trefoil emblem of the United States’ Second Corps is proudly emblazed above the Irish Brigade marker, as well as many others. But it’s a monument nearly a mile away that is perhaps the most remarkable of Irish stories in Gettysburg. Looking over Cemetery Ridge, just south of the Pennsylvania Memorial stands Father William Corby, standing a top a boulder, arm stretched to the skies. The brigade chaplain, Corby of Notre Dame, offered absolution to the little more than 500 soldiers of the Irish Brigade on July 2, 1863 before the regiments took position in the Wheatfield that afternoon. He reportedly reminded them of their duties and warned them not to uphold the flag. While the Irish Brigade would suffer great casualties that day, its story is remarkable – and a great reminder of the Irish pride and legacy here in Gettysburg. But if it’s Irish luck you’re after, you better head to the top of Little Round Top on the Gettysburg battlefield. And after you’re finished admiring the view, turn to the monument of Col. Patrick O’Rorke, of the 140th New York. He was one of several officers who lost their lives on that hill, but it’s his nose that helps visitors to Gettysburg connect with history, and a little Irish luck. For decades, the bust of O’Rorke, standing only shoulder-high, glimmers in the setting sun – the bronze rubbed raw by visitors rubbing the colonel’s nose for luck. It’s an unofficial tradition, of sorts, for many visitors, and a great way to remember the Irish in Gettysburg. You’ve stared into the eye of the Irish Wolfhound, visited the statue to Father Corby, and rubbed the nose of Col. Patrick O’Rorke … it’s time to head into town and grab a bite to eat, perhaps a drink to wash it down. Our first recommendation is named for the colonel of the 140th New York himself – O’Rorke’s Family Eatery & Spirits. The restaurant features both American and Irish fare, including Corned Beef and Cabbage, Shepherd’s Pie, Bangers and Mash, Fried Cod, and even Irish Nachos – homemade kettle cooked chips topped with Shepherd’s pie, cheese and scallions. Finish up with an Irish Cream Bash for dessert or sit back with a pint of Guinness. There are signs of the Irish throughout Gettysburg including over 80 Irish whiskeys at GarryOwen Irish Pub, once named one of the top Irish pubs in the world … outside of Ireland, that is. The restaurant is authentic Irish, all the way down to the owner’s family recipes. Every summer, the Gettysburg region celebrates its Irish heritage at the Adams County Irish Festival, held the third week of July. Music, food, beer and vendors circle the Gettysburg Moose Park and rejoice in the spirit of the Irish. 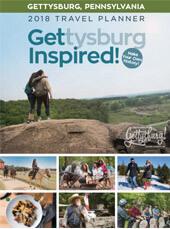 Create your own Irish experience this St. Patrick’s Day, or any day in Gettysburg. Hire a Licensed Battlefield Guide to learn even more stories about the Irish valiance in the Battle of Gettysburg, grab an Irish souvenir at one of our downtown Irish shops, and of course, always finish with a pint of Guinness. How could you neglect to mention Garryowen?!? Good good and extensive selection of Irish whiskies.